Tell me – is this a country that we can proud of? Pakistan was supposedly established as a homeland for Muslims, to free them of discrimination. This same country now allows persecution to continue not just unabated but often by the writ of the state. Intolerance and ignorance have a foothold in the fabric of this society, and today’s tragedy further highlights this horrific state of affairs. I am ashamed and disgusted. 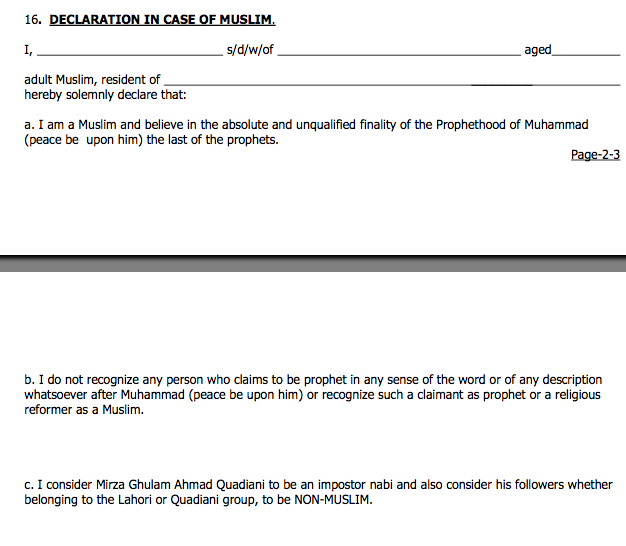 This is a screenshot of the Pakistani Passport Application. Please note section c. This to me further emphasizes the problem. Everybody loves a bloody conspiracy theory. Forget cricket (*cough* hockey), guys! Let’s play conspiracy battleship! Maybe we’ll actually win! The problem is more than a peculiar domestic phenomenon for Pakistan. It has grown into a narrative of national victimhood that is a nearly impenetrable barrier to any candid discussion of the problems here. In turn, it is one of the principal obstacles for the United States in its effort to build a stronger alliance with a country to which it gives more than a billion dollars a year in aid. So here’s a question for you, dear readers – are conspiracy theories an integral part of Pakistani society? I have blogged about this topic on numerous occasions, oftentimes venting my frustration with leaders and media personalities who peddle Zionist/RAW/Blackwater enemies like a freaking bake sale. Bomb blasts in Lahore? It was obviously the work of Mossad. Bomb threat in Peshawar? Well, I did see some Americans with beards roaming around. Must be Blackwater up to no good again. But does this narrative exist within a spectrum of opinion of Pakistan, or does it represent the national sentiment in Pakistan? If I was reading the NY Times article and didn’t consider the nuances of such an issue, I might believe that conspiracy is a collective part of Pakistan’s imagination. But I would ironically be doing the same thing as someone who parroted yet another one-sided theory, wouldn’t I? There’s little doubt that many Pakistanis believe all sorts of things that are false and that some extremist sectors peddle paranoid conspiracies. Propaganda is a standard tactic used by political and religious leaders of all types to manipulate their followers, as is casting blame on external enemies for those leaders’ failures. Indeed, it’s virtually impossible to find a society free of extremist paranoia, and Pakistan undoubtedly has its share. And that’s to say nothing about the orgies of “conspiracy theories” churned out on a daily basis from right-wing talk radio, blog outlets, Fox News and even establishment Republicans over the years — from Iranian computer viruses, Vince Foster’s murder, the nefarious Muslim-Leftist alliance, ACORN’s omnipotence, and Obama death panels to The Vicious War on Christmas, the DOJ’s “Al Qaeda 7,” Maoist followers in the administration, Obama’s Kenyan birthplace and Islamic beliefs, and the subversive Congressional interns serving at the behest of CAIR. According to a poll by Harris Interactive in March, many Republicans believe that President Obama is a “domestic enemy,” with 24 percent (14 percent overall) claiming he was the Anti-Christ (Interestingly, 38 percent of Republicans polled also believe he’s doing “many of the things Hitler did”). Um, yeah. The issue of paranoia in Pakistan is not without merit, but it’s also unproductive to view this phenomenon as a reflection of the entire nation, (unless we have significant poll numbers). Moreover, it’s important to ask why such beliefs actually exist, and look at the root causes of the problem. In the case of Faisal Shahzad, shuttling blame from one country to another is really not going to get us anywhere. Hmmm. 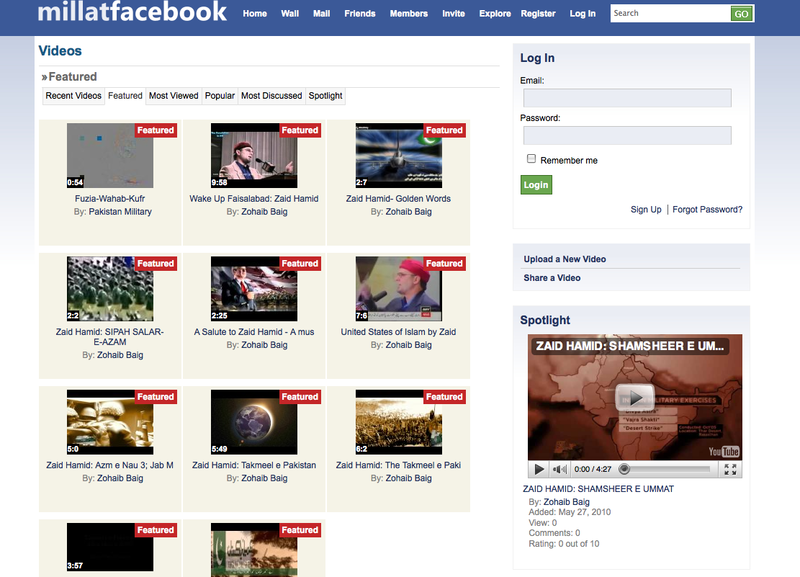 MillatFacebook Apparently LOVES Zaid Hamid. Do you? Should the expulsion of 130 individuals from Swat Valley to a military-administered camp be considered collective punishment, if all families refused to surrender their Taliban-linked relatives? Is this action then ultimately a violation of international law? Even if the families didn’t give up their relatives, should they be banished to refugee camps and made IDPs? Or could the situation have been handled without this expulsion? Now that they are in these camps, how long are they expected to stay there? Will they be welcome to return home in the long-term? The development raises important questions that should be asked in an asymmetric war where the lines between good and bad are more blurred than polarized. Moreover, given Pakistan’s still-pertinent IDP (Internally Displaced Persons) situation, it seems problematic to actively add more people to camps, seemingly without a strategy to return them home. Although many IDPs have since returned to Swat since last year, numbers of people in the country continue to be displaced due to military operations. The United Nations High Commissioner for Refugees (UNHCR) estimated last month that there are roughly 1.24 million IDPs in Pakistan, (The recent landslide in Hunza has displaced more people, and about 1300 people are currently housed in a camp in Altit village). I wonder though whether the damage has already been done. From South Park to the LHC Ban – How Did We Get Here? 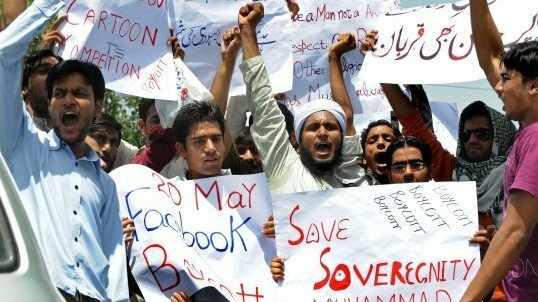 How on earth did we get from a South Park cartoon being censored to the Lahore High Court banning Facebook? I did NOT ‘declare’ May 20 to be “Everybody Draw Mohammed Day”…At any rate…my cartoon-poster, with a fake ‘group’ behind it…went viral and was taken seriously. I never started a Facebook page (I see that the two men who started the different FB pages names have now been made public). The vitriol this ‘day’ has brought out, of people who only want to draw obscene images, is offensive to Muslims who did nothing to endanger our right to expression in the first place. Only Viacom and Revolution Muslim are to blame, so…draw them instead! So it seems that Comedy Central’s censorship has ultimately led to more censorship. Does anyone else sense the irony here? It is not that I don’t think “Everybody Draw Muhammad Day!” isn’t purposefully offensive and hateful – looking at the Facebook page, the wall is littered with derogatory and ignorant statements against not just the Prophet but against all Muslims. Even if the group claims to not “slander the average Muslim,” the problem with any movement that goes viral is that the intended aim eventually becomes irrelevant, an after-thought. Wannabe “artists” are no longer concerned with the reason behind the South Park censorship, but instead use this platform to lob insults at the religion as a whole. Any sane person would tell you that’s ingredient for disaster. But a sane person would also tell you the answer is not blocking the platform all together. First, blocking Facebook doesn’t mean the group went away, or that “Draw Muhammad Day!” was stopped altogether. Second, why does the state get to weigh in on a viral movement and subsequently make arbitrary decisions that don’t just blind Pakistan to the event but also cuts citizens off from the entire social networking website? If Pakistan reportedly has 2.5 million active Facebook users, that essentially means 2.5 million people were not given the opportunity to make the choice themselves. It essentially sends the message that the state knows what’s best for you, even if you know better. To me, that’s just as unproductive. Freedom of speech is a tricky issue, there is no doubt about that. An anonymous blogger quoted on Norris’ website emphasized, “Fight for the right to draw Muhammad, but then decline doing so.” This is a significant (albeit still controversial) statement. Yes, people have a right to voice their opinion – getting death threats as a result just fuels the root causes behind that opinion in the first place. But to use this as an opportunity to incite and marginalize a community already on edge? That’s another thing all together. As for the Pakistani government, concentrate on the big picture. Because the LHC decision may have only exacerbated the situation further. Q: Kashf was started in 1996 and was Pakistan’s first microfinance institution. What inspired you to establish the organization? Many factors impacted me in making the plunge in 1995 to set up an organization that specifically catered to women’s financial needs. The first imperative was of course the fact that women in our society do not get the due acknowledgement they deserve for their contribution to the overall economy. Time and time again, during my travels while I worked for the World Bank in Pakistan, women from all walks of life – rural women, urban women, educated women, illiterate women, working women, home makers – would tell me the same thing, that they wanted a better life for themselves and their families, however, they lacked economic opportunity. This resonated across the country, from when I sat with shy and veiled women in Kalat in Balochistan to when I engaged with highly empowered and articulate women from the plains of the Punjab. The second was related to my own commitment, I had grown up in a Pakistan where I had not faced any discrimination on the basis of gender. I was and am strongly committed to the notion that we can build a world free of gender discrimination – that comes with two strategies, empowering women economically (providing them a financial voice) and investing in their social status (through education and health). Q: Although the Grameen Bank model has been tremendously successful in Bangladesh, there were many who believed that microfinance would not be as successful in Pakistan. Why do you think this may have been true in the past and how is the Kashf model different? We were the first to offer an array of women friendly products: loans for productive purposes, for consumption needs, insurance products and housing loans. We were the first to replicate Grameen’s solidarity lending methodology successfully in Pakistan and subsequently the first to move to individual lending as the market matured. 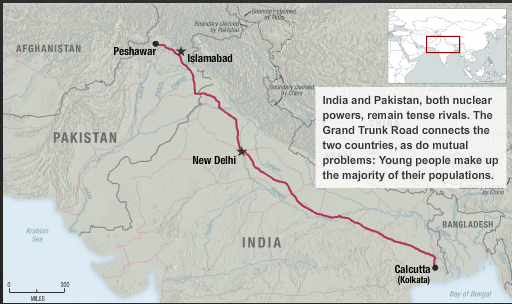 Q: Have any of Pakistan’s endemic issues – from the volatile security situation, its political upheavals between military to democratic rule, to its rampant corruption – hindered Kashf’s growth? 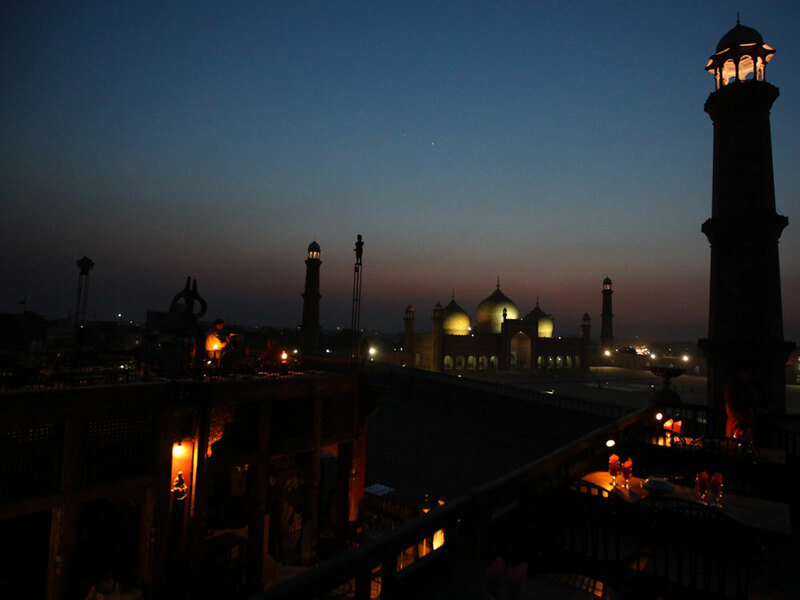 What have been some of the major obstacles Kashf has faced in the last 14 years? Until 2008 we were able to grow our programme at an average rate of 40-50% annually, however, the economic meltdown in 2008 combined with rapid inflation led to a major slowing down of operational outreach. Furthermore in 2008, much like other sectors, the microfinance sector was impacted by the deteriorating economic and political situation. Pakistan’s economy shadowed the meltdown of the global financial system, through the second half of 2008 and 2009. While this impacted the entire economy, households at the bottom of the pyramid, which form a majority of microfinance users, were especially hurt. Overall inflation had a regressive impact on low-income households, i.e. the increase in food prices eroded their purchasing power, since they tend to spend a large proportion of their income on basic consumption needs; a food security research conducted by Kashf Foundation in August 2008 reveals that households were spending up to 70% to meet monthly food requirements. Thus, low-income households’ ability to invest in the overall needs of their families has been severely constrained and strides made in the past decade to improve the economic conditions of low income households have been negatively affected. Additionally, the ability of microfinance users to make payments on their existing loans has been somewhat impaired, due to business failures and decreased economic activity that has reduced the quality of the microfinance portfolio in Pakistan. At the same time, the demand for microfinance loans has increased multi-fold, as a result of inflation and the decline in the exchange rate, which means that people need larger loans to set up small businesses. The economic recession coupled with rising defaults and business failures amongst microfinance users has increased liquidity and refinancing risk for microfinance providers, both in terms of being able to raise additional funds and to meet current debt obligations. The recent “Banana skins” report taken out by Citibank and CGAP has revealed that credit risk is an emerging issue across the global microfinance sector, while costs of undertaking microfinance operations are negatively affecting the sustainability of many institutions. Moreover, the economic turbulence has been coupled with socio-political disorder at multiple tiers, and microfinance providers face a high level of political risk as there is an increased perception of the dwindling writ of the state and a deteriorating security situation. Additionally, a precedent for popular mobilization has been set which increases the risk of political intervention in the microfinance sector as different tiers of government are largely unclear of the role microfinance has on pro-poor growth. There has also been an increased tendency of governments and political parties to introduce populist unsustainable income support programs, which suffer from typical targeting and rent seeking symptoms, and are contrary to the spirit of sustainable financial services. Consequently, uncertainties stemming from the political set-up have adversely affected the economy, especially microfinance providers. Q: Kashf Foundation hires many young Pakistanis who work as loan officers for the organization. What has been your experience working and mentoring these young officers and what has inspired them to work on the ground? I would not describe it as any other way but inspirational. It is for us to give hope, encouragement and positivity to the youth of Pakistan. At Kashf, we hire men and women fresh out of college, who then become harbingers of change within their communities. The fact that they are part of a socially responsible institution unleashes their inner and latent potential – I have seen loan officers get promoted to Area managers in a matter of years. In Pakistan we don’t lack talent, we lack good institutions to harness that talent. We have to focus on building institutions that can provide opportunities to young people, and at the same time we have to build their entrepreneurship skills. For this reason, we decided to initiate a youth empowerment programme at Kashf. Q: What have been some of the organization’s greatest successes? Where do you see Kashf in the next 5 years? The most rewarding part of my work has been seeing real life changes. Only a few weeks ago I was visiting Kasur, an area hemmed very close to the Indian border, and which is famous for its leather works. I had the opportunity to visit a mature client Baji Jamila, who had been working with us for the past seven years. I entered the courtyard of her small house which had an uneven brick flooring, part of the house had been newly constructed and was built a little higher than the rest, creating two levels of access. When I arrived, I saw Baji Jamila busy in small ante chamber that she had converted into a mini loom factory. Six years ago, Jamila had invested in a small spindle machine, which she purchased secondhand for US$150 to spool thread, package it and sell it in the local market. This business had proved quite profitable and she now has four such spindles working simultaneously, spooling different colored thread on small spools. Jamila’s husband Muhammad Mansha, seeing the success of his wife’s business left his job as a small time clerk and began working for her, taking care of purchasing the raw thread and getting it dyed, while she ran the spindles and managed the 20 women who work for her to package the thread. It’s stories like these that really warm one’s heart and make one realize that the impossible is possible. Overall all, we have seen a successful ramping up of our programme and since 1996 have disbursed loans to 1 million entrepreneurs across the country and provided US$225 million in working capital. We have also seen that over 60% of our clients invest in new businesses, which has a multiplier effect on the local economy. Within the family this leads to higher income, higher savings and lower food vulnerability and often it translates into better education and healthcare of children. We often see evidence of improvements in women’s self esteem (90% of mature clients state that they feel more empowered) and easing in tensions between family members. On a financial level, Kashf Foundation has demonstrated a sustainable approach to delivering MF to low-income communities especially women. Our aim is to reach out to 650,000 active clients by 2014. This interview first appeared in Dawn Newspaper on Friday, May 14, 2010.